It’s such a commonly used metaphor, yet so profound. It’s such a philosophical statement, with multiple interpretations. I’ve always wondered: are my inner most thoughts and feelings visible from peering into the depths of my soul? How much of “me” is shown to the world through my eyes alone? Perhaps it is not as abstract as I had thought. It is said that a person’s eyes reflect their honest emotions and personality. Whether it be faking a smile, or telling the truth, the eyes reveal all. It is said that the skin around the eyes naturally crinkle when genuinely elated, but not when feigning happiness. Certainly a lot can be deciphered about a person’s emotional state by observing the condition around their eyes, i.e. wrinkles, eye lids, eyebrow shape, etc. But what about the eye itself? The pupils dilate or contract depending on mood, and can change its size prior to looking at something of a different brightness depending on what it expects. However, did you know that eye colour can also tell us something? 55% of world has brown eyes, blue and hazel eyes each make up 8% of the population. Green eyes are super rare, only 2% of people have it. What’s even rarer than that is having two eye colours at once. This is called heterochromia. So what can having heterochromia tell us? There are three types of heterochromia. Central heterochromia; in this type of heterochromia, the iris has a different colour near the border of the pupil with spikes of the central colour radiating out from the pupil. Benign heterochromia is heterochromia not caused by an eye disease, and doesn’t affect vision acuity. Infants are born with benign heterochromia, or develop it during childhood as their iris attains its full amount of melanin. When it is an inherited genetic trait, it is called congenital heterochromia. Otherwise, if it appears later in life, it is called acquired heterochromia, and usually arises from eye injury or disease. Congenital syndromes characterised by heterochromia include: Waarneburg syndrome (a genetic condition that can cause hearing loss and changes in colouring of the hair, skin, and eyes), Horner’s syndrome (due to birth injury or intrauterine brain injury involving the sympathetic nervous system innervation to one eye), Sturge-Weber syndrome (characterized by a port-wine stain in the distribution of the trigeminal nerve on the face and tumours known as angiomas of the brain and choroid), and Neurofibromatosis type 1 (is a disorder in which there are tumours of nerve cells together with disorders of melanin, causing abnormalities of skin and eye pigmentation). Acquired conditions that cause heterochromia include: the inflammation of parts of the iris of any cause, may cause loss of iris pigment in the affected eye; and some glaucoma medication that induces darkening of the iris from stimulation of melanin production. A tumour in the eye called an iris nevus generates a brown discolouration is a round shape. Iris nevi usually remain benign, stable in size, but careful monitoring with an eye doctor is needed to spot any malignancy. Although it may look like it in light coloured eyes, discolouration caused by a nevus is not called heterochromia. Another case is anisocoria, characterised by unequal pupil size. Anisocoria present at birth is harmless and the difference is usually unnoticeable. Large differences are caused by traumatic injury, resulting in what seems like a darker looking eye colour. 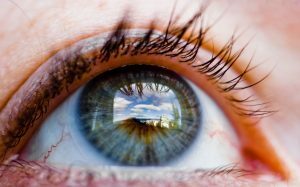 It’s certainly true that our eyes mirror the state of our internal body, and we should do a check-up whenever something looks or feels out of the ordinary. Remember, our eyes are the window to our souls. Protect them well.